I received a phone call this morning, which is a ritual around our house on a Saturday usually asking, "Are you training?" To which I like to ask in return, "Are you?" - since this is the whole reason for the call; to see if they can come out and train. "The dogs get wise to where you are putting your birds. It always seems to be human nature to keep putting birds in the same spots... don’t!" This time, the question was a bit different. It was a cry for help. A plea for the snow gods to stop dumping all this white stuff and allow a weekend warrior the ability to plant birds that will fly. And birds that do not bury themselves in the snow - for the dogs to pass whilst they are quartering in the chest high snow. Their pattern through the deep snow resembles a bulldozer effect. Sometimes the dogs may pass the buried birds due to not being able to smell them or they trap them if their heads stick up from the hole they are in. Needless to say, winter has been cold and a bit long here in Minnesota - and other places, too, from what I hear. Kansas and Nebraska had ten inches of snow on the ground. Iowa is not much better. Other places, as well, have had their fair share of white stuff. So how does one cope with this issue to get that flusher and fetcher working in these mid-winter months? You don’t need to stop! You can still train! It takes a bit of ingenuity, thought, and determination. If you are a seasoned, winter-training veteran, you may have even planned ahead - planting or locating a particular food plot of cover that will handle winter snows. For those that haven’t, I think this article can offer suggestions that could help. One was new to me today! It struck me like snowball hitting me in the face! First and foremost, a field. You must have a field or woods to work in. Common sense... right? A field with some high canary grass that isn’t knocked down by the snow is great. 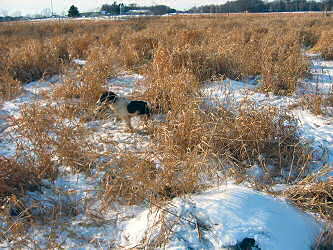 Canary grass becomes clumpy in the snow so your dog will eventually go from clump to clump - which is OK. You want him to go find birds, right? Where do birds hide? Clumps! The key to this is having effective clumps. Clumps that are in somewhat of an order that allows a dog to still quarter and hit clumps in that pattern. Christmas trees and brush piles are great! Yes, it is February. You need to plan ahead for this one, too. You must talk to the people that you work with, neighbors, family member, etc... to get all the trees that you can muster up. They will last through the spring when the cover is still smashed from the snow. Pigeons will sit on a Christmas tree limb on the opposite side of the dog’s pattern. This can be hard to predict, but you can pretty much bet that if you are heading north, the dog will make its quartering passes on the south side of the trees. Doing so, the dog will not see the pigeon or game bird - but will smell it. This is, assuming that you are going into the wind. When planting, dig an adequate hole with your boot or shovel, allowing the bird plenty of room to move around and get its wings open - so it can fly off when that fine flushing dog of yours makes scent. Another tip with Christmas trees is to move them around! Don’t have them in the same place all of the time. The dogs get wise to where you are putting your birds. It always seems to be human nature to keep putting birds in the same spots... don’t! Yes, white pigeons. Sounds a bit silly, doesn't it? However, if you are in a situation where there is not much cover and you don’t want dogs looking for birds, but rather, smelling them - white pigeons work great! They are camouflaged. Dig holes in the snow to plant birds in, if it is deep enough. 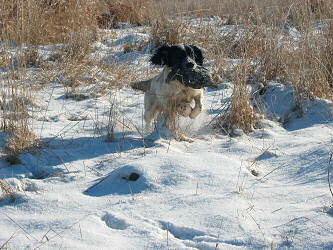 Place your holes in areas of grass so that the dogs still have to hunt an area in order to find the birds. Make the holes big enough so birds can move around and get away from the dogs coming from the heavens, down upon them in their igloo of a hiding spot. Pigeons and chukars are the easiest, pheasants can be tricky. I am reminded of a real long winter here in Minnesota, four or so years ago. I was training with a group that were going to the Euclid field trial in March of 1999. We had snow - more than waist deep. There had been some freezing and thawing going on during that winter, so the snow was well packed in areas. A two hundred pound Sasquatch type guy could walk on top of it - until, all of a sudden, he would break through to his waist. Thirty-four pound cockers and forty pound springers do just fine on top of this stuff we call frozen, snowy crud. They can magically run across snow; like Remo Williams does in his movie with his trainer, Chang (I think that was his name). Of course, the ring-neck pheasants run like stags on snow like that! Then you know what happens? Spaniels take chase, trying to make these fiends fly. This, my friends, will really test how steady your well-trained dog actually is. As you are standing in waist deep snow, with a frozen whistle, sweating - due to the extra labor it takes to walk in the snow, you are hoping your dog hups. "This, my friends, will really test how steady your well-trained dog actually is." Sessions were very tough as you can imagine. My buddy, "Tequila Scurr", and I hit the road for some grass... fields, that is! We wanted to see some dirt! So did the dogs. I swear, we started a grass fire from the way these two dogs ran that day in Euclid. To top it all off, we were brace mates! We cleared the whole course. We found every bird... it was just really fast and kind of out of control looking. You can actually go out and make swooping, quartering patterns in the snow with a four-wheeler. Drive it in many arcs and straight aways - but mostly figure-eight style patterns from one end of the field, to the other. Lay out your course in different directions - from east to west, as well as, north to south. This allows you some places with pre-dug holes, if you want to look at it as such, to place birds. It also prepares you, in case there is a thaw and then, a re-freeze. You already have a place to walk and run dogs - and neither one of you will have to fall through the crusty snow. As a side note, this is not ideal... this is for the desperate! I can’t stress enough that this is not an ideal training situation, but it is training. That is better than nothing. The straight aways will give you a good place to practice long marks without losing birds in fluffy snow. Of course, that is assuming you can throw your bird or dummy to land on the trails that you have created. The last option? Plow your field with a snowplow. I would suggest that you plow trails, not the field. Otherwise, you will break all that grass that is there for your spring training. The grass that is temporarily just in a frozen, standing, buried in snow state. Believe it or not you’re going to get hot! You’re going to sweat. Dress in layers, but light ones. Be prepared to take off some layers as your day of training goes along. Wear sunglasses, polarized in some way are the best in my opinion. It will help to protect your eyes from the bright, blinding snow. Wear waterproof boots. You will last longer with dry feet. Waterproof pants are great, too. With them, you can get down and dirty with young dogs - and older ones - with a good pat on the head. Gaiters are great for keeping your lower legs dry and warm in lower snow situations. Ah yes, this may seem a laughing matter, but if yours is frozen and you need it, due to a dog chasing, you will be jumping in the snow to make a snow angel and pray for forgiveness! Your dog broke because you blew the whistle out of your mouth instead of producing that "pip" that you are used to hearing. Blowing your whistle at ten degrees is a problem. They freeze up! You walk through the field breathing, drooling, etc... all into your whistle. So what do you think will happen? They freeze up and make funny sounds. It is a simple fix; blow into the top part of the whistle a time or two periodically as you are drooling - I mean, trudging through the field. That generally cleans it all out and it will sound better. Here's another tip. You know where the birds are planted. So if you have a dog that you know you have to “pip” on that whistle in order to get him to stop on a flushed bird, give your whistle a cleaning out prior to the dog getting to the plant. You have to be a bit careful in exercising your dog. Ice can cause damage to joints, hips and even cut pads. The snow itself will push your dog more. In other words, they will have to work quite hard to get through it... hence the bulldozer effect. Your sessions may be shorter due to the dog becoming tired more quickly. They will not move as fast. These are all good things, if used for the right reasons. The snow will build muscle. Keep in mind that the pup might run real fast when snow is gone. Be prepared. Don’t over exercise your dog to the exhaustion point. They will be using muscles they are not used to using and you don’t want to cause any injuries. Use common sense. Frozen feet can be dangerous. Some dogs are more prone to it than others. A rule of thumb that I like to use; if it is close to 0 degrees or below zero (Fahrenheit scale), obviously, the dogs tend to last, at the most, fifteen minutes until they are walking on three legs. If they are really talented, two legs. Be careful! Frostbite to the ears or feet is nothing to take lightly. In conclusion, I hope one or more of these tips will inspire or help some of you that have not already been out training, to get off the couch and get training! Get out this week and stretch your legs... and the dogs’ legs, too. You’ll both feel better with a little exercise. 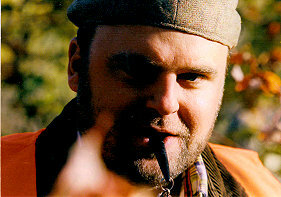 Tony Roettger of Minnesota owns and operates Roettger Ridge Kennels. 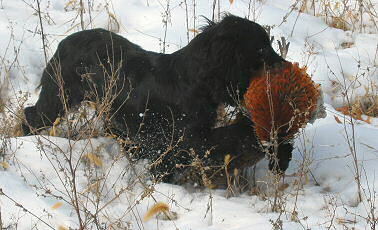 He breeds, imports and trains English Cocker Spaniels and English Springer Spaniels.